I celebration of the Chinese New Year, I have this little offering. It’s just the first finished from a series – I have one other inked and two more in pencil stage. 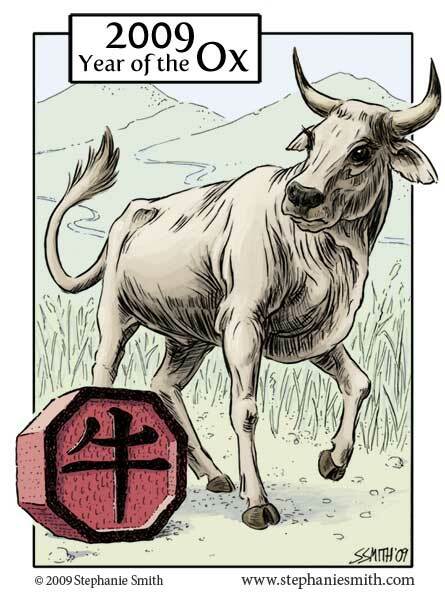 When I’m done I’ll have the entire Chinese zodiac. Thanks to a bout of stomach flu last week this is a bit late… but just squeaked by in time for the holiday. I’m still not entirely happy with the background coloring and the typography, so I’ll probably do some more tweaking before making it available for sale. This entry was posted in Astrology, Finished drawings by stephanie. Bookmark the permalink. Oh, I love it! 🙂 Good work, as always.